Five people in possession of tablet computers of various sizes are seated around a table. The conversation in all three panels of this comic proceeds as follows. Woman 1: Hold on. My Android Nexus 7 just froze. Man 1: Everybody take a five-minute reboot break. 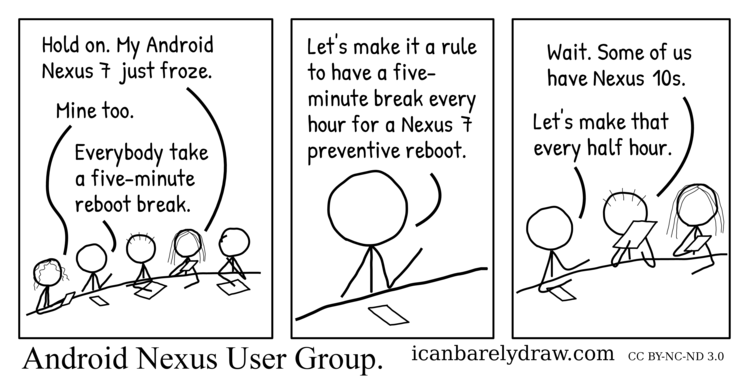 Man 1: Let's make it a rule to have a five-minute break every hour for a Nexus 7 preventive reboot. Man 2: Wait. Some of us have Nexus 10s. Man 1: Let's make that every half hour. Title: Android Nexus User Group.